Paris Saint-Germain star Kylian Mbappe reportedly turned down a move to LaLiga giants Real Madrid in 2017 because of the club's all-time top scorer Cristiano Ronaldo. Mbappe has come a long way since his arrival at AS Monaco on his first professional contract in 2016. The Frenchmen wreaked havoc in front of goal for the Ligue 1 side and was soon bombarded with offers from the biggest and richest of clubs in Paris Saint-Germain, Real Madrid and Manchester City. The striker rejected moves to the Premier League and LaLiga and instead joined PSG on a season-long deal, where he netted 13 goals and registered seven assists in 28 Ligue 1 appearances. Needless to say, the deal soon turned into a permanent contract. This season, Mbappe has scored 23 goals and provided 14 assists in 28 appearances for the club so far. His goal against Saint-Etienne on Sunday also made him the first French player to score 19 goals in his first 18 games of a Ligue 1 season over the last 45 years. A report in Daily Record UK now claims that Mbappe had initially agreed a staggering fee of €180 million to join Los Blancos but backed out when he realised that he would be brought in to replace his idol, Ronaldo. Mbappe and his father reportedly thought that becoming Ronaldo's successor was too big a task and too pressurizing for the then-teenager. In comparison, PSG was a more realistic deal as the forward would not be required to leave France and would not miss out on the kind of money that Real Madrid had to offer. 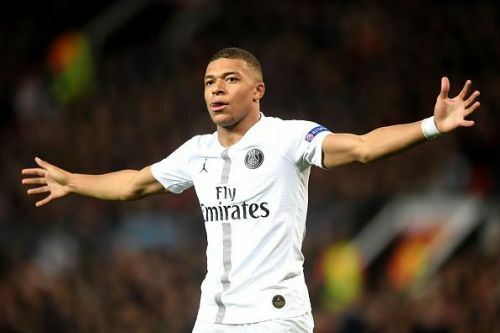 It makes sense that Mbappe's father would have thought that a move to Paris would have been more convenient for his teenage son as it would mean that he did not have to leave his hometown to get the kind of exposure and money he needs. Whether or not the move was turned down because of the mammoth task of succeeding Ronaldo cannot be ascertained, but it appears Los Blancos are now even more keen on bringing in the Frenchman to replace the gaping hole left by the Portuguese ace when he left for Juventus last summer. Kylian Mbappe has had an impeccable season so far with the Parisiens. PSG are next scheduled to face Montpellier in the Ligue 1 on Wednesday night and the Frenchman will be hoping to add to his goals tally for the season.